Happy New Year Wishes to all..
2014 was like a roller coaster for me, actually my year 2014 started in India and i came back home during february with loads of beautiful memories from India. I had many funfilled moments with my Chennai blogger friends and stayed with Kalpana of Life with Spices 's cozy appartment for three days, i still cherish those awesome moments. When its comes to blogging, i kept my work somehow constantly eventhough i have to go through many difficult moments. However Blogging helped me a lot to forget all those challenging moments, yes life is not that much easy to manage. I ran two whole month's of blogging marathon with Indian regions and International cuisine as theme for 26days starting with alphabets. Do check Indian Food Odyssey and Around the world to know my adventures. Also i have some proud moments to share, one fine day i got a mail from a journalist of the famous Indian magazine 'The Hindu' asking about Pondicherry cuisine, obviously i said ok hence my first interview of this year got featured here. Next one appeared here and third one is here as the star of the week. Not to forget i participated three cooking classes conducted by famous brands here in Paris and had loads of fun learning delicious dishes with some French bloggers. I have posted 278 posts during this whole year and approaching my 3000th post very much soon. Hope you enjoyed this post and am very thankful to each and everyone for being part of my blogging world, nothing is possible without you all.This post is going to Srivalli's Best of the year 2014. Dutch Cuisine is well known for its simple dishes with many vegetables and little meat. Dutch cuisine means Netherlands cuisine and their foods are not well known as other International cuisines like French,American or Chinese,but there are many Dutch delights which you must try atleast once in your kitchen.Those delicious Dutch foods includes Poffertjes, the small,fluffy pancakes traditionally consumed during fall and winter,Bitterballen the deep fried snack balls typically served with mustard sauce as dipping,Stroopwafels, a delicious chewy cookie,Oliebollen the popular doughnuts,Limburgse Vlaai, a delicious pie with a tasty light crust, Patat the Dutch style french fries etc and the list goes on. 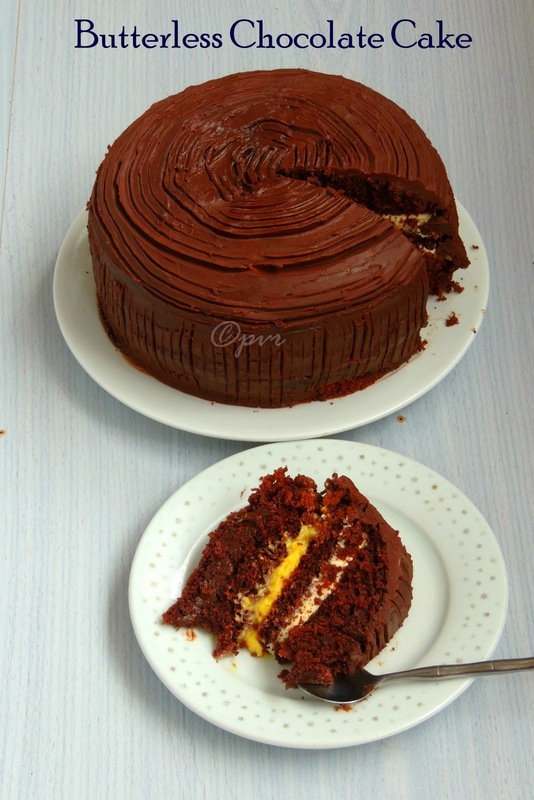 I always want to make their utterly delicious super buttery cake ' the famous Boterkoek'. 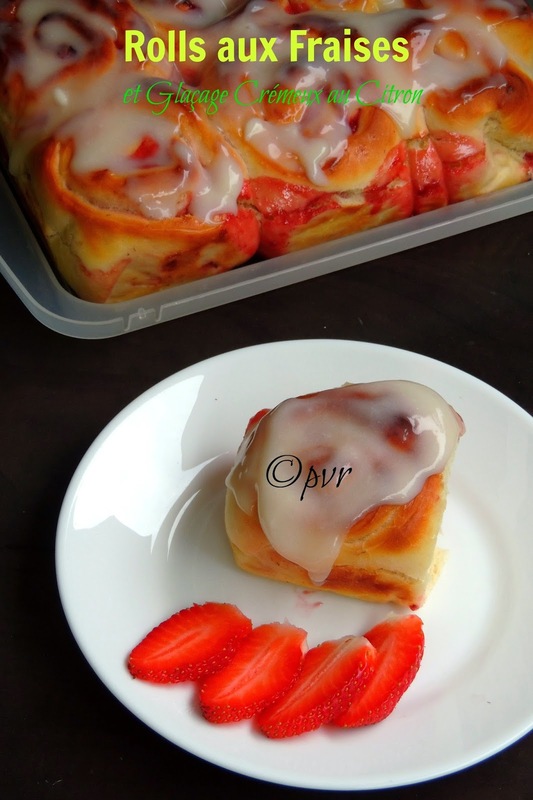 Finally i got a chance to give a try to this incredible bake as this month's International Food Challenge ,a monthly event started by wonderful food blogger Sara goes Dutch Cuisine. White Alfredo sauce is one of the easiest, no fuss dish you can make it just in few minutes with simple ingredients available in your kitchen. Its definitely a cheaper, flavourful, quicker sauce. The main ingredients for making this sauce is garlic cloves, cream and parmesan cheese. If you are in hurry, you can dish out this cheesy white sauce quickly.Actually my today's post goes for a simple but flavourful Alfredo sauce, if you want to add meats or sea foods or else vegetables,just go with your choice.However this simple Alfredo sauce works awesome to serve with any type of pasta. 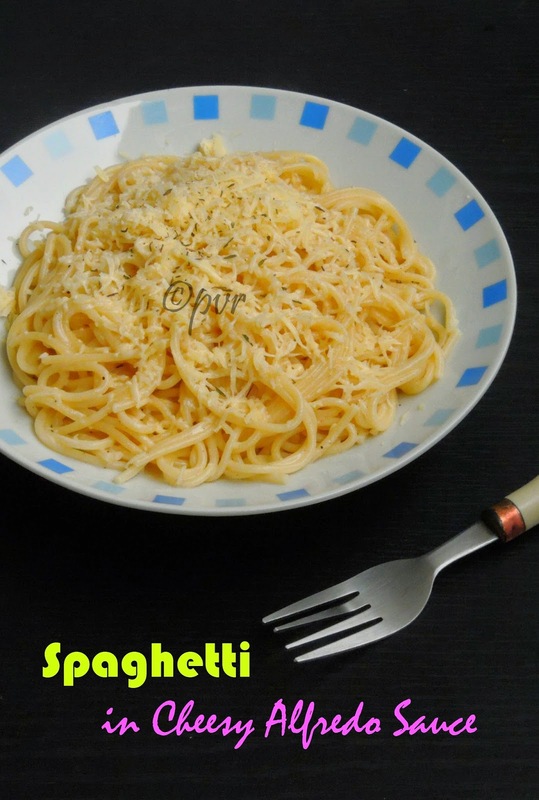 We had this spaghetti with alfredo sauce for our lunch during this weekend since i was bit busy with my Christmas shopping, trust me this sauce is just fabulous. 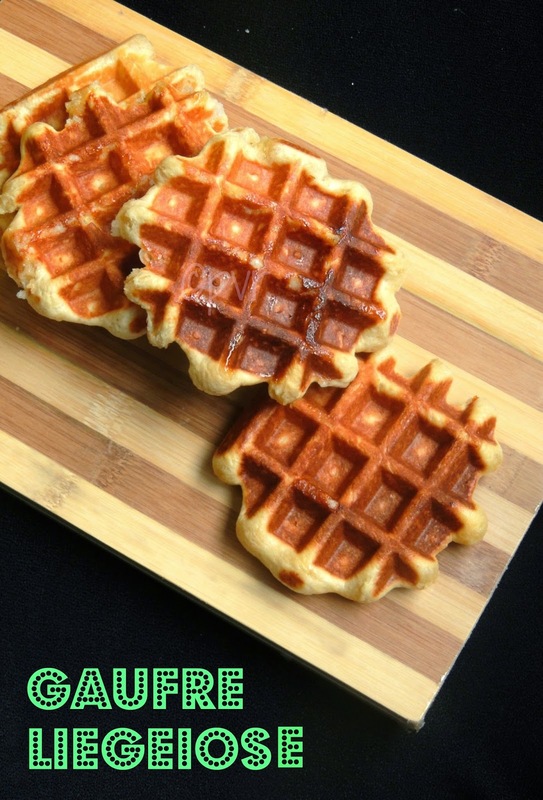 I adore few of my kitchen gadgets and i cant survive without them. Since ever i got my toast sandwich maker, this gadget took an important place in my kitchen. Even my younger son prepare his favourite sandwiches with my modest sandwich maker. Sandwiches are easy to make and its satisfy immediately some hungry tummies quickly. 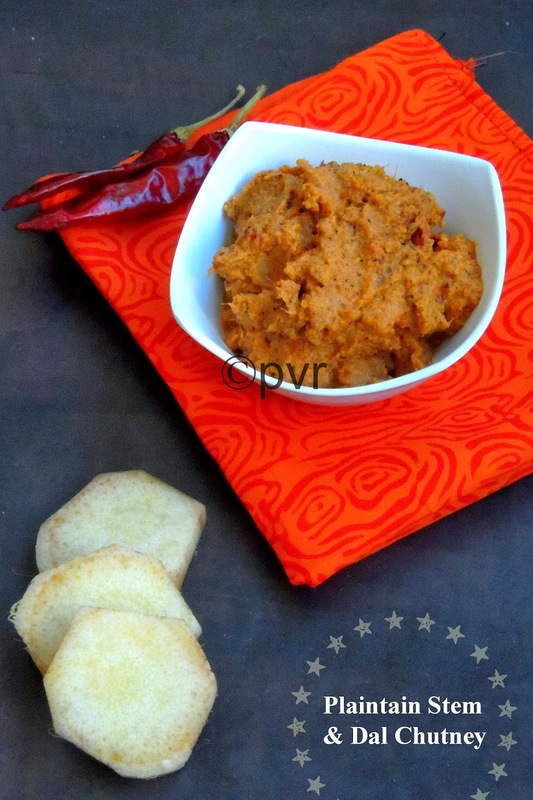 Whenever i feel lazy to cook, my sandwich maker comes in rescue.My today's post is a simple sandwich with a spiced mashed potato masala. 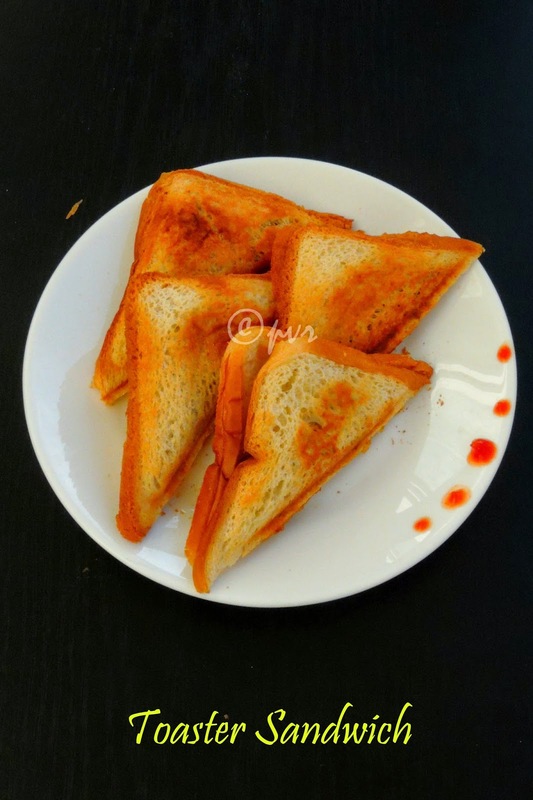 As all of you know, am running the last week of blogging marathon of this year with Menu card as theme, this toaster sandwich is also from the online menu card All Menus. I love Christmas festival, its a festival of gifts here, who will say no to share gifts with others , obviously this festival makes everyone happy. Earlier in India, since i did my schooling in a Catholic school, its quite a tradition to keep the christmas tree, decorations etc at school. So Christmas festival is quite close to my heart. Back home during 80', every 24th december, we used to wait for Santa claus as we get our favourite Dairy milk chocolate as christmas gift on 25th december, earlier i thought Santa do exists, but later we found that Dad was the one who get chocolates for us saying that Santa disposed the chocolates in our balcony. I cherish those nostalgic moments and never failed to tell the famous Santa's story to my kids once they came to know about the inexistence of Santa. 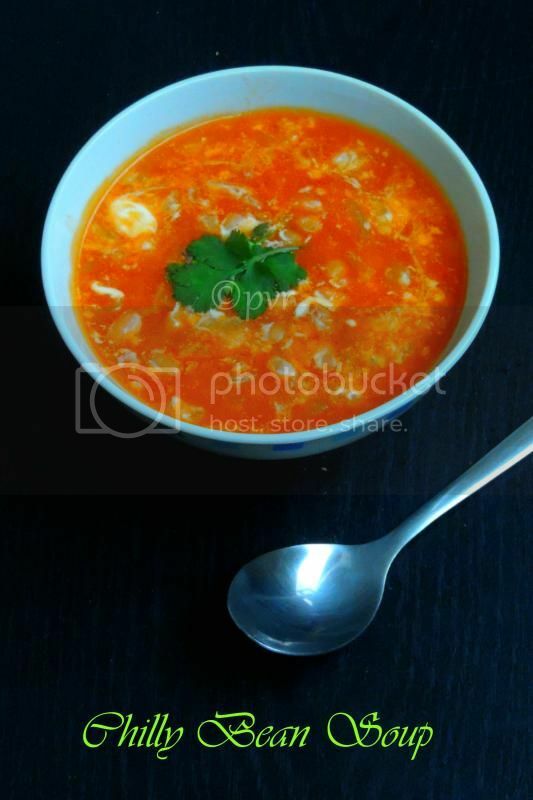 Soup makes an excellent meal during winter day, i love a quick, simple and easy breezy soup to have for my dinner especially after an hectic day. Obviously my space will have many varieties of soup and i do variety of soups atleast thrice a week. When i picked menu card for this week's blogging marathon, i know i'll be making a soup as my first post of this last week of blogging marathon of this year. Srivalli, the brain child of this monthly blogging marathon suggested couple of online restaurant menu cards and picked All Menus as my restaurant menu card. I cooked three dishes from this menu card and for my first day i simply dished out this chilly bean soup from the list of SOUPS. Am baking this Norwegian christmas bread for the second time, this bread goes for this month's We Knead to Bake, monthly event by Aparna, My Diverse Kitchen.Julekake or Julekaka/ Julekaga is a rich holiday bread flavoured with cardamom which is traditionally served at Christmas in many Scandinavian countries. 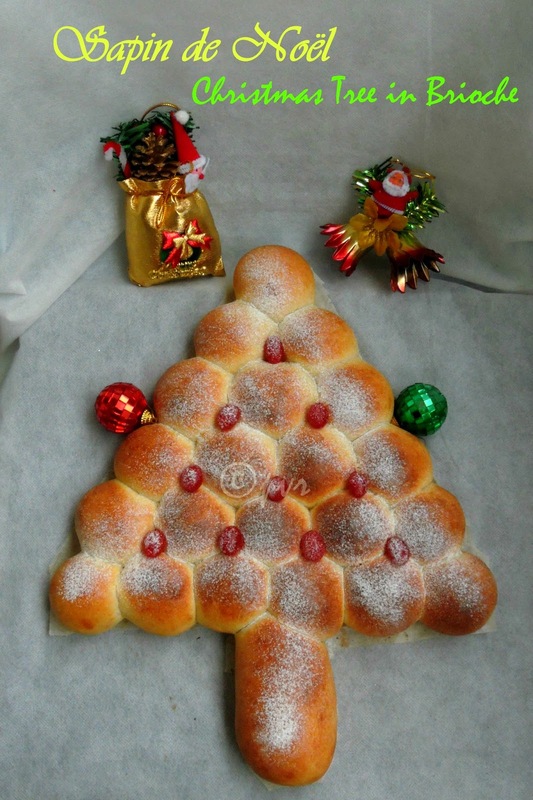 It is particularly popular in Norway and Denmark.Julekake means “Yule Bread” in Norwegian. This bread is more cake-like in texture and sometimes it is dusted with powdered sugar or glazed with a white sugar icing. If it is not glazed or left plain, then it is usually served warm at breakfast with butter or a goat milk cheese called geitost/ brunost. Finally the most awaited Christmas vacation is here, obviously my oven is bit busy since two days, am catching up with many bakes i have missed doing during last two months. 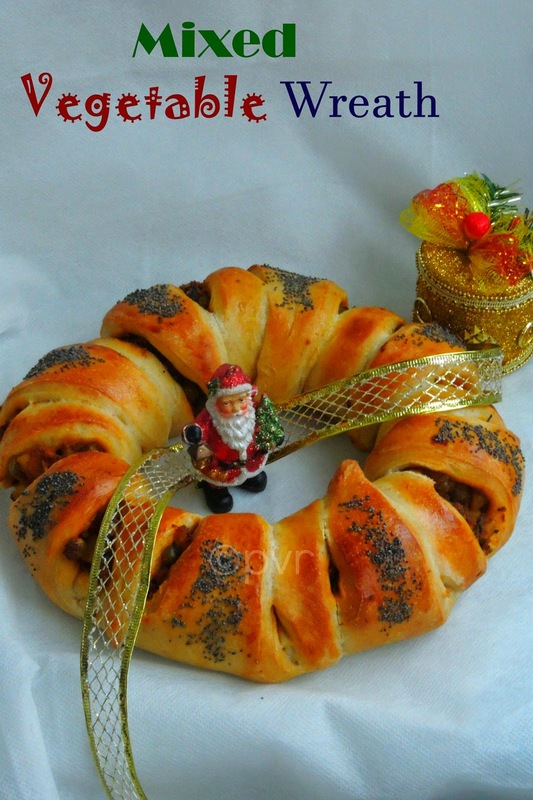 I have couple of cakes and breads to give a try at home as they suits prefectly awesome for the upcoming Christmas celebration. 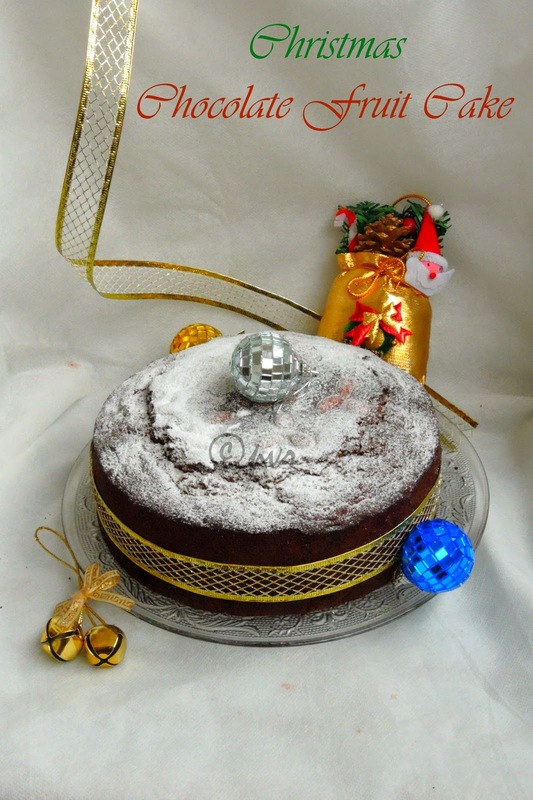 If you are still waiting or searching to make a super rich christmas fruit cake with loads of nuts or fruits then today's cake will definitely satisfy your sweet tooth. 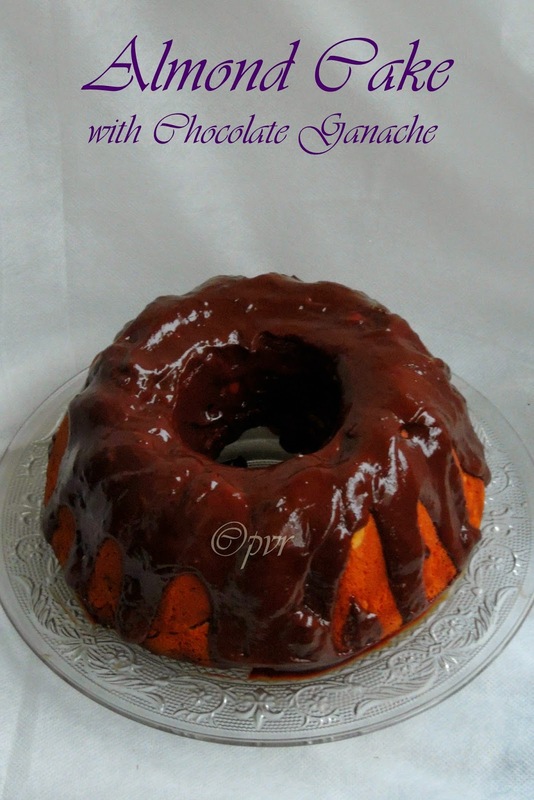 This cake goes for chocolate chips and cocoa powder, obviously a prefect Christmas treat for a chocoholic person like me. 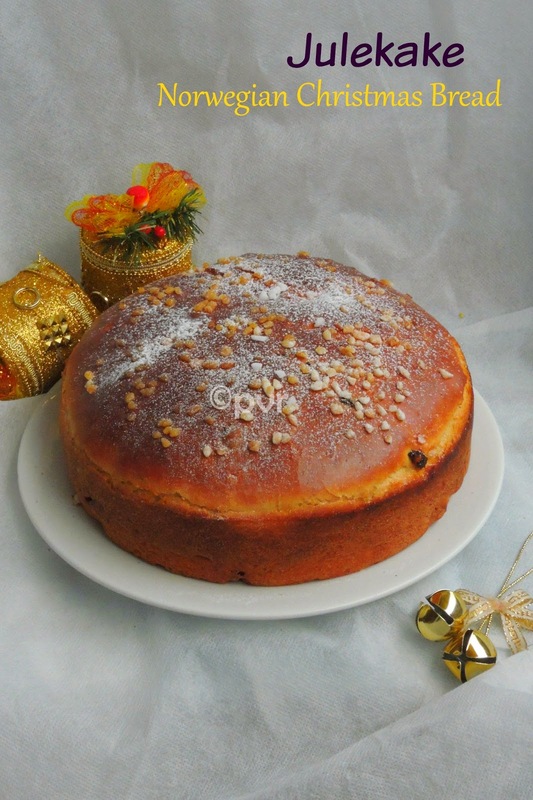 Actually i forget to soak the dry fruits for making this Christmas special cakes, but cooking them in honey and brown sugar gives them an excellent texture as much as like the soaked ones. 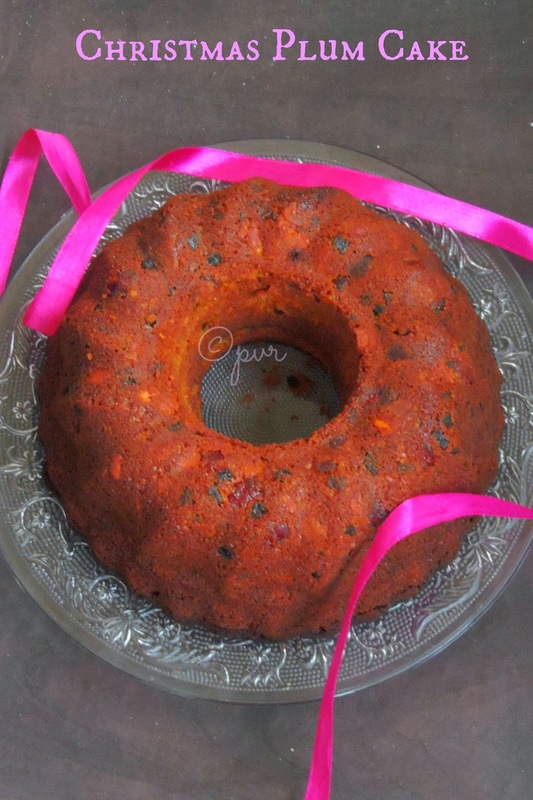 However i didnt missed the flavor of the soaked dry fruits in this cake. 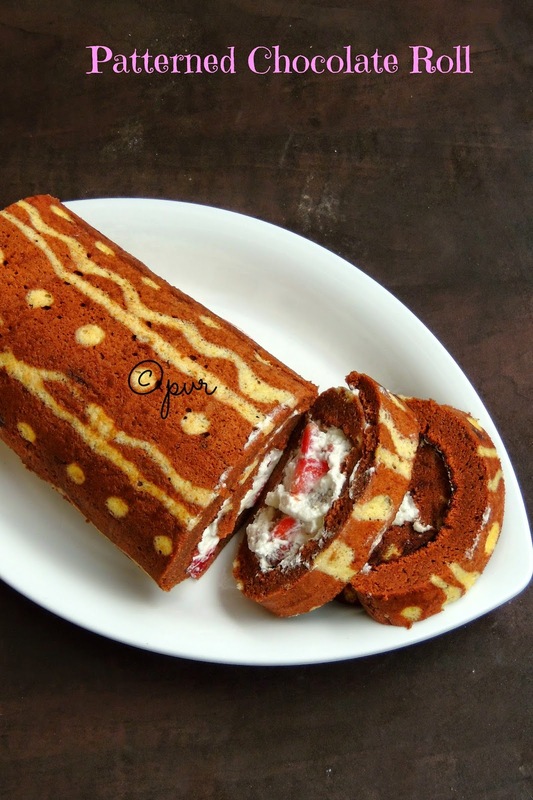 The spice powder, orange zest added in this rich cake brings the holiday mood while having this cake. Today am taking you all to Hawaii, one of my favourite place where i seriously want to go atleast once in my life. Since i love this place i couldnt stop myself to try their pillowy puffy doughnuts as am running my third week of blogging marathon with Doughnuts as theme. Actually Malasadas are famous Portuguese donuts carried by the Portuguese immigrants from Acores Island during the 19th century. Immigrants who worked in sugar mils carried their rich cuisine especially their famous confections, the Pao doce and the Malasadas. Malasadas.these doughnuts are made by the portuguese immigrants during Mardi Gras (the fat tuesday), the day before the Ash wednesday which is the last day of Carnival of Madeira. The reason behind of makng Malasadas was to finish up the lard and sugar in the house. This tradition was taken to Hawaii, where the Shrove tuesday is celebrated as Malasada day. 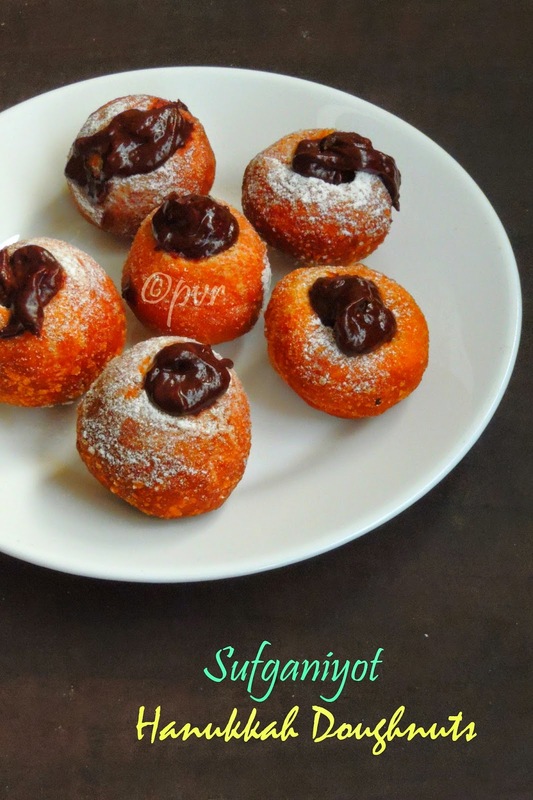 After an addictive Finnish Munkki, am taking you all to Israel, i picked Sufganiyot for this week's blogging marathon as am running with doughnuts as theme for this week. 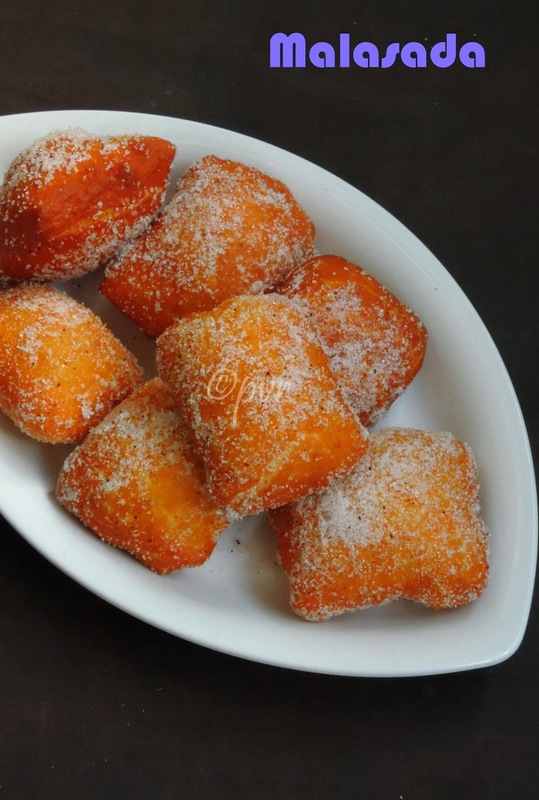 Doughnuts doesnt need any special introduction and these deep fried beauties can be found around the world in different form with different filling or without any filling. After the ring like shaped doughnuts, today's Sufganiyot goes for a round ball shaped fried balls. Usually Sufganiyot, this jelly doughnuts are the famous national treat during Hanukkah. 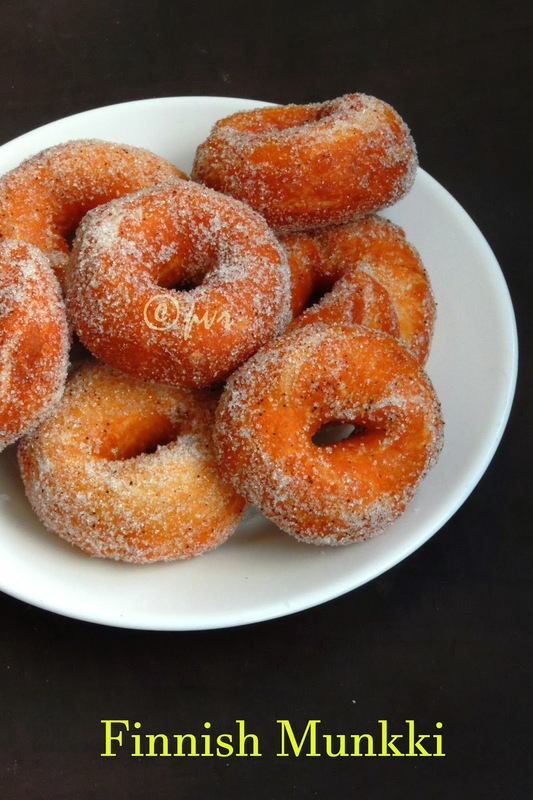 Traditionally this popular doughnuts is prepared with jelly eventhough now many variations with many different fillings do exists. I made my Sufganiyot with chocolate filling aka nutella instead of jam filling as none want these doughnuts with fruit jam filling. Finnish doughnuts, is well known as Munkki, the speciality of these deep fried beauties are: they are simply flavoured with cardamom.The munkki are eaten any time of the year, but specially during and around on Vappu which means the 1st day of May month.In Finland, they have a special oil thats sounds like lard but as much as like butter t fry this yeasted doughnuts but however some fry these doughnuts in oil. 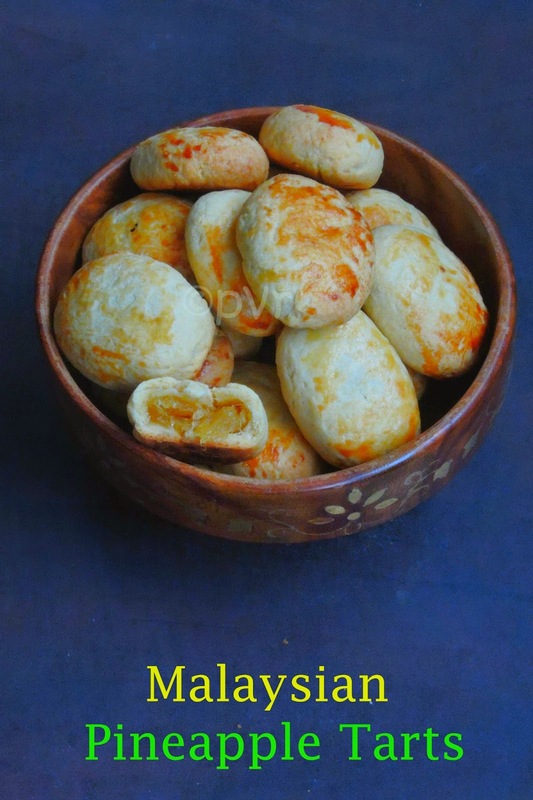 The dough of munkki is very similar to pulla’s one but instead of baked, they are fried. Finnish doughnuts can find also shaped as a ball but the traditional one looks like ring,once fried these doughnuts gets well coated with sugar and cinnamon powder.If using bread machine, you can make the doughnut's dough easily, since i prepared the dough with bread machine, the dough came out extremely prefect. Baking a cake doesnt need any special occasion, i love baking cake for our evening snacks whenever my sweet tooth crave for. I always want to bake a super nutty cake with a chocolate glaze or ganache, finally i did it when i got chocolate and cream as this month's secret ingredients for Shhhh Cooking Secretly Challenge started by me few months back.Every month i'll make a pair with the members, then later we secretly discuss with our pair to exchange two secret ingredients among us, finally we cook with those secret ingredients,finally we will post on next month between 16-18th during every month. My pair for this month is Viji, a darling sister who blogs at Virunthu Unna Vanga,she gave me two of my favourite ingredients. She knows me very well, since am a chocoholic person i was super happy to get chocolate and cream as my secret ingredients for this month. 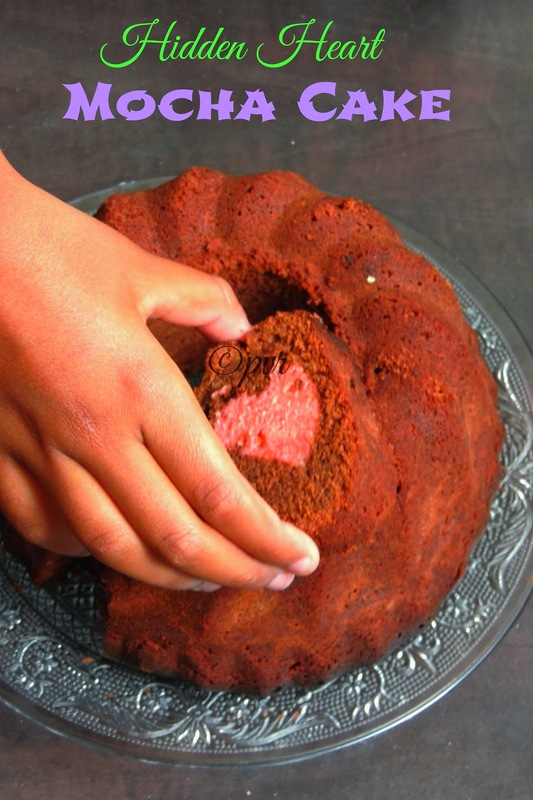 Immediately my mind went for a dessert, but i changed my mind and went for baking a cake. 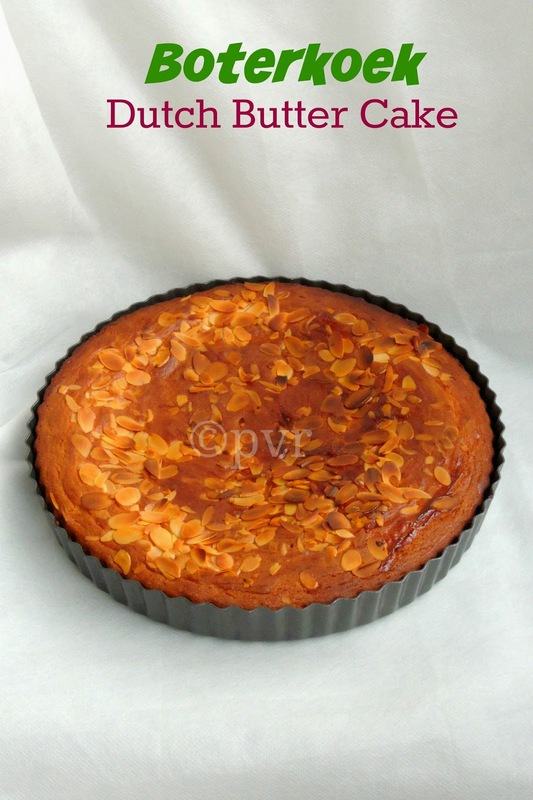 Malaysian pineapple tart, this dangerously addictive buttery tarts are in my to do list since a long. My to do list never comes to an end. Everytime, i'll check my to do list, i feel like making all together but imagine who will eat if i prepare all those pastries and breads.However i'll try to dish out atleast few whenever i have nothing to do.Still i dunno when am going to clear my to do list. Ok let me stop blabbering. Coming to today's baked beauties, these cute looking Malaysian pineapple tart are very easy to make at home. 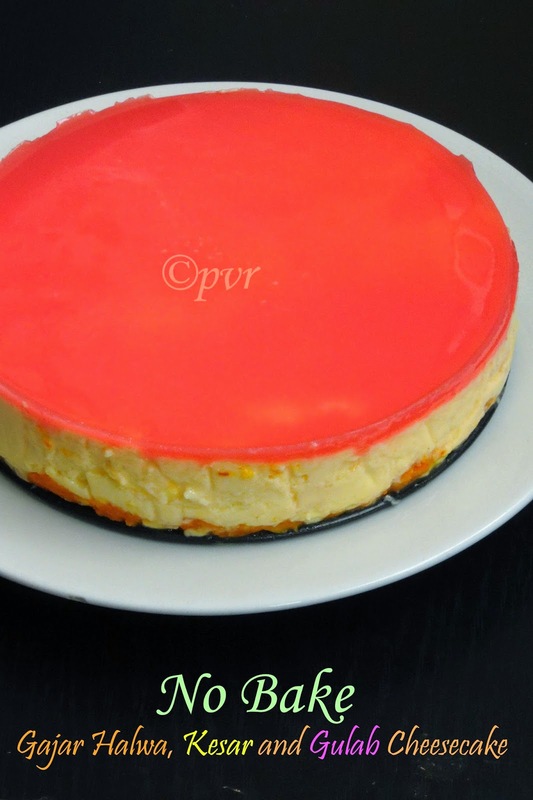 When i saw the recipe for the first time, i thought it may take half a day to get ready as we need to prepare the pineapple jam specially for making this tart. But trust me, if you have all the ingredients besides you, you can make this tiny tarts very much quickly than you can imagine. I prepared my pineapple jam with canned pineapple chunks,which was quite easier than making pineapple jam with fresh ones. No peeling,chopping,cleaning etc,so if you are planning to make this pineapple tart, better stick with the canned pineapple chunks. After Kongunadu, Nanjilnadu cuisines, today am taking you all to Chettinad Cuisine, this cuisine is very much close to my heart. 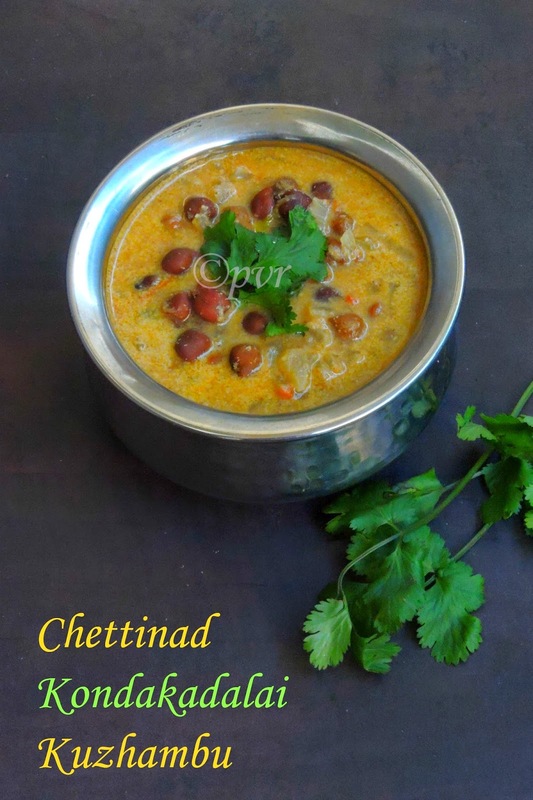 Chettinad cuisine doesnt need any introduction and this cuisine is very popular among the other cuisines of Tamil Nadu. 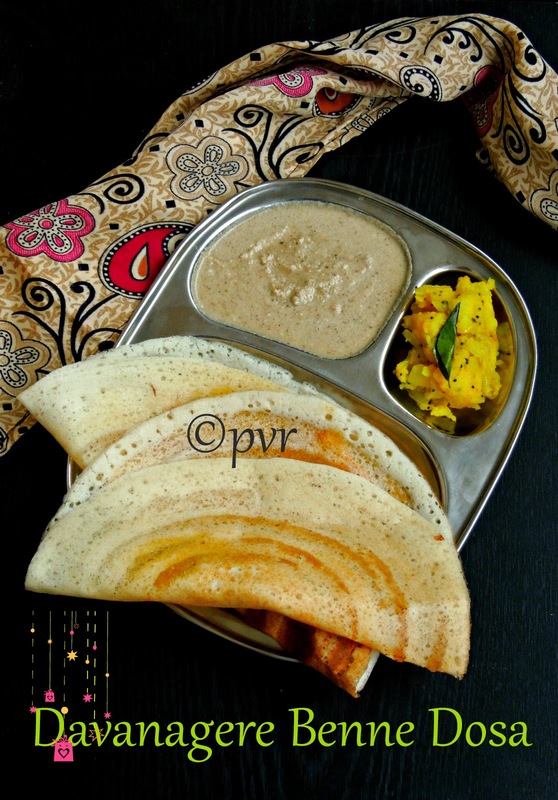 Both their vegetarian and non vegetarian Chettinad dishes are equally very famous among Tamilians. Spices and their style of cooking foods are totally different from other cuisines. You can see many chettinad dishes in my space as i love their cooking very much. Whenever i feel like cooking something delicious and flavourful obviously i'll go for Chettinad cuisine. Since i picked one state and three different cuisine for this week's blogging marathon, am posting this lipsmacking Chickpeas gravy. This dish suits prefect to have with rice or else breakfast dishes like idlies,dosas, pooris etc.Sending this gravy to MLLA#78 guest hosted by Pj of Seduce Your Tastebuds,event by Susan. 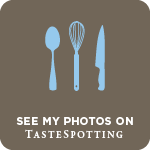 Am running a week of blogging marathon with an interesting theme ' One state and different cuisine'. After lipsmacking Kongunadu cuisine, am taking you all to Nanjilnadu which means the town and its surroundings of Kanyakumari district.Nanjil Nadu occupies a special place in Tamil Nadu due to its historic, geographic and cultural identity.Nanjil Nadu is one of the most beautiful places in South India which is located in the southern tip of India.It is also closer to the Kerala state capital, Thiruvananthapuram which is 65 km away to the south-east of Nagercoil & 65 km to the south-west of Tirunelveli.Nanjil Nadu is well connected by train. There are many tourist attractions in Nanjil Nadu and their cuisine have both Tamil and Kerala style touch. Most popular dishes of Nanjil nadu is Theeyal(curry made with roasted coconut) Ulunthuchoru(urad dal rice), Mutta avial,Pazham pori,achu murukku etc. 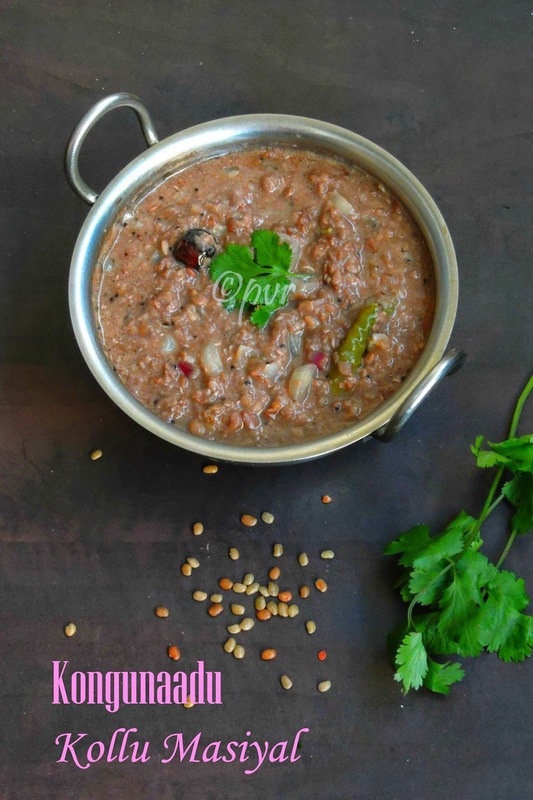 Kollu or horsegram, this lentils is very much known in Southern part of India for its nutritional value,if anyone want to loss their weight its adviced to take horsegram in their diet. Horsegram have their important place in Kongunadu cuisine of Tamilnadu. Kongunadu comprises the modern day districts of Coimbatore District, Nilgiri District, Tirupur District,Karur District, Erode District, Salem District, Namakkal District, Dharmapuri District,krishnagiri District and parts of Dindigul District.Their cuisine is quite famous for the simplicity of their dish, most of the dishes goes for an easy breezy preparation.As per wiki,Kongu Nadu cuisine is basically a collection of exotic recipes being created by the people residing in the Kongu region. 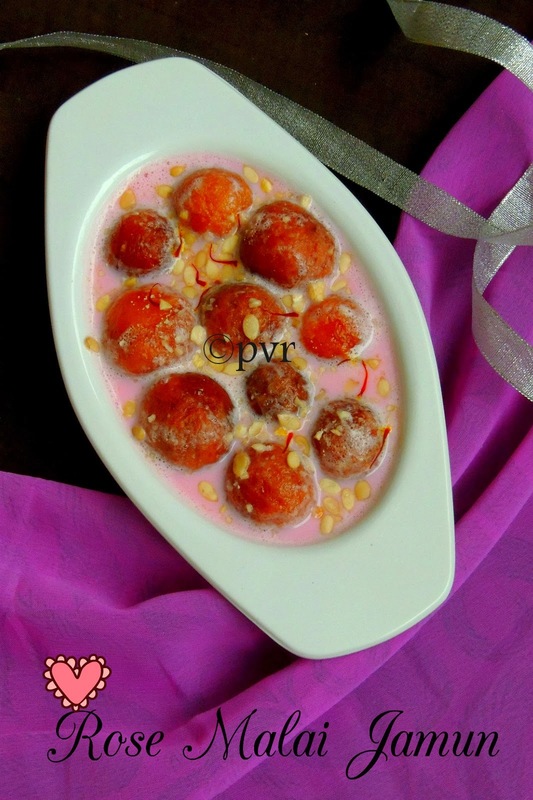 The cuisine is quite extensive for a simple reason that the region is vast. 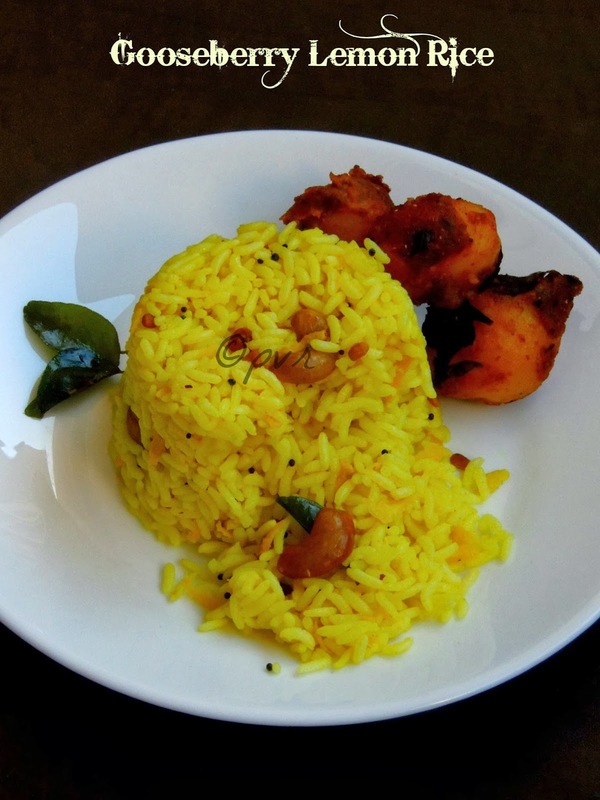 Unlike other cuisines, Kongu Nadu cuisine does not involve marination of any raw material. 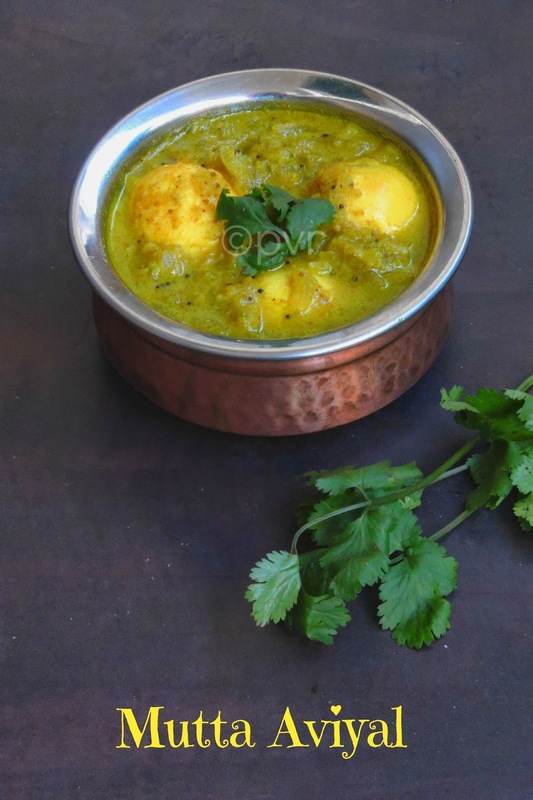 As a result the food has a different taste and unique texture.Turmeric is always added into curries which gives the product a deep yellow color and an aromatic substance including Arisemparupu, famously known only in Kongu region. Christmas is nearing very fast and the festive mood is already everywhere here. Last year i missed all these festive moods and this year i dont want to miss anything for any reason. In two weeks, we will be in christmas holidays and we have already started our programme for this christmas holidays eventhough the weather is terrific here, after all its winter here. Its getting dark already at 4pm and this dull climate makes us super lazy. Suddenly today i felt like baking a spicy bread and started preparing the dough earlier in the morning to finish my bread before the daylight goes on. Thank god, everything went well and i clicked few before its becomes dark. Today's recipe is definitely a favourite for savory lovers, this wreath is this week's challenge of Fond Bites-Bake Along a weekly event by Subhashini, she suggested this edible flower for this week.Every week we get to know about the week's challenge on sunday and the members of this group should bake and share either in their blog or with the group members before the next sunday. We love anything with peanuts, i never tried peanut butter at home as peanut butter are dead cheap here and they are easily available in both Chinese and African super markets. But i always want to make peanut butter at home since a long. 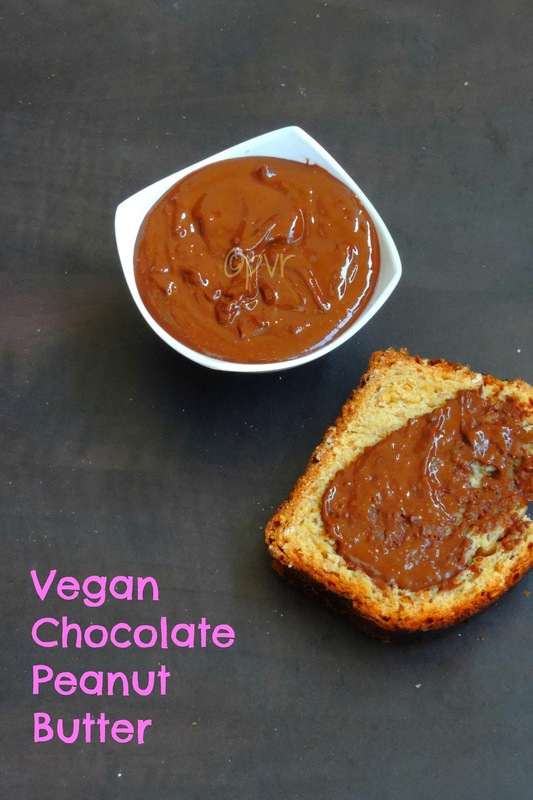 Finally i did it, yes i just whipped up some vegan peanut butter with chocolate to have with bread. Trust me,making peanut butter at home is definitely very quick and seriously easy to make. Just roasted peanuts makes this fantabulus peanut butter,in case if you want to flavor it just go on. My today's recipe goes for obviously roasted peanuts, melted chocolate with dark brown sugar and salt. Just 4 ingredients is enough to make this beautiful spread.How easy na. Most of my readers know very well how much i love oats,if you check my recipe index you can find varieties of dishes i dished out with oats. Oats is my all time favourite, its a versatile wholegrain. One can cook oats from Indian to International cuisine depending upon their tastebuds. I love oats in any form, eventhough my all time favourite dish with oats is Oats Pongal, its been a while i baked bread with oats. Actually i should blame my studies and internship. My internship took all my leisure time usually, i spend for baking. So baking took a backseat, but however i try to bake as much as possible during weekends.Obviously weekends are very special for me now. After a fabulous German potato bread yesterday, today my post is going to be this mildly sweet and healthy fibre rich loaf. This loaf goes to this week's blogging marathon as i picked Tame the yeast as theme. As i told earlier, this bread was suggested by Veena of Vegnation along with Priya's German bread. 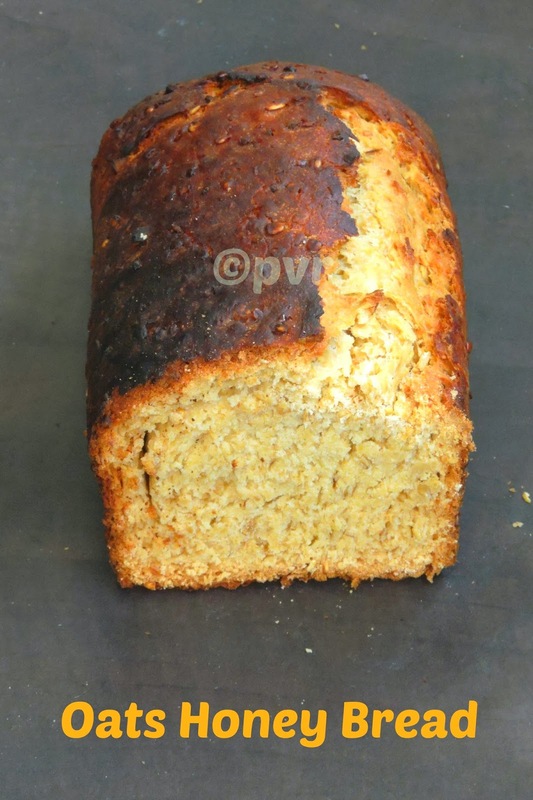 I couldnt stop myself baking this bread as i love both oats and honey in breads. Kartoffelbrot is German potato bread which is very easy to prepare at home with cooked and mashed potatoes. Germans are the biggest consumers of bread as much as like French. No wonder, they eat bread for breakfast, for lunch and for their dinner. Even kids carry bread in their snack box or in their lunchbox. German potato bread goes for simple ingredients and this bread makes an excellent breakfast,lunch or dinner when served with any spreads or simply served along with a bowl of soup.Usually this Kartoffelbrot have an egg in it, but today's bread is completely eggfree and totally vegan. This bread goes to this week's blogging marathon, as i picked Tame the yeast as theme. 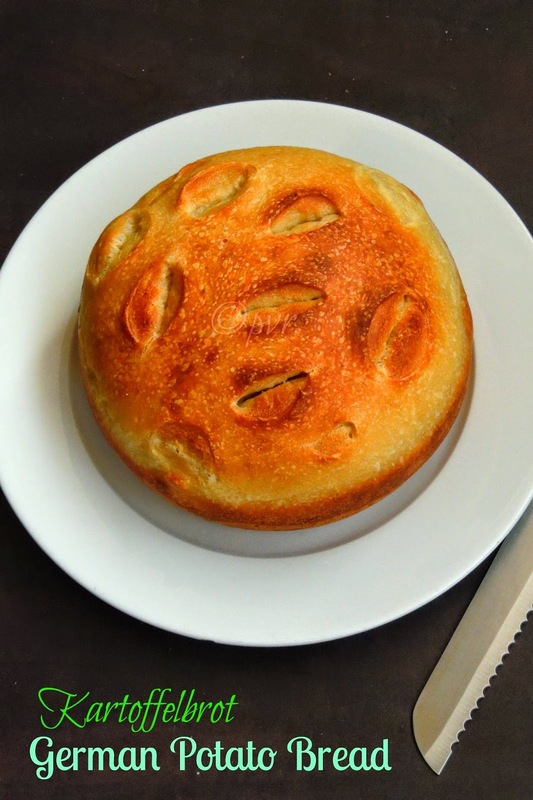 As i told earlier,every month two marathoners shares their bread with us and we bake those yeasted bread at home and blog about it during a week of blogging marathon. We can finish this three days blogging marathon with a dip, sauce or else sharing baking basics.As always i baked both breads and simply whipped out a delicious spread.